Boeing [NYSE:BA] and flyadeal today announced the Middle East carrier is growing its fleet with the 737 MAX to take advantage of the airplane's fuel efficiency, range and passenger comforts. The airline committed to ordering 30 airplanes with options for 20 more in a deal that would be valued at up to $5.9 billion at list price. SEATTLE, Dec. 21, 2018 /PRNewswire/ -- Boeing [NYSE:BA] and flyadeal today announced the Middle East carrier is growing its fleet with the 737 MAX to take advantage of the airplane's fuel efficiency, range and passenger comforts. The airline committed to ordering 30 airplanes with options for 20 more in a deal that would be valued at up to $5.9 billion at list price. The deal is subject to both sides concluding final terms and conditions and a purchase agreement. It will appear on Boeing's Orders & Deliveries website once all contingencies are cleared. flyadeal, a subsidiary of Saudi Arabian Airlines, offers affordable flights within Saudi Arabia. Over the past year, the airline has conducted an evaluation process for 50 narrowbody airplanes to support domestic growth and potential international expansion. While flyadeal has been operating new Airbus A320s, the airline says it has selected the 737 MAX for the future. Director General of Saudi Arabian Airlines, His Excellency Eng. Saleh bin Nasser Al-Jasser said, "The demand for air transport services in the domestic market of the Kingdom of Saudi Arabia has grown exponentially. A new brand, with a fresh identity focused on low-fares, flyadeal has brought to the market a new choice – which has been received very positively." 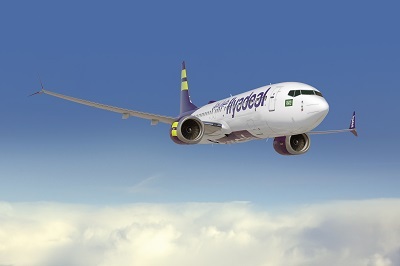 Al-Jasser added: "The low-fares airline will continue to expand rapidly, and the addition to the fleet aligns well with flyadeal's target to grow its presence in the domestic market and cover new markets outside of Saudi Arabia." flyadeal selected the 737 MAX 8 which has capacity for 189 passengers in a one-class configuration. Compared to flyadeal's current fleet of A320s, the MAX 8 carries 12 more passengers and provides 8 percent lower operating costs per seat. "flyadeal has opened up more affordable flights to millions of travelers and we are honored that the airline has chosen the 737 MAX to power its exciting expansion," said Ihssane Mounir, senior vice president of Commercial Sales & Marketing for The Boeing Company. "We have supplied commercial airplanes to Saudi Arabia for more than 70 years and we look forward to finalizing this agreement and delivering advanced jetliners to flyadeal in the years ahead." Boeing's partnership with Saudi Arabia's aviation industry began in 1945 with the delivery of a DC-3 aircraft that gave birth to commercial air travel in the kingdom. Over the past seven decades, airlines in the kingdom have operated almost every Boeing commercial jetliner, including the 707, 737s Classics, MD-11Fs, 747s, 777s, and 787 Dreamliners. The 737 MAX is the fastest-selling airplane in Boeing history, accumulating more than 4,800 orders from over 100 customers worldwide. The airplane's superior performance is enabled by the latest technology in the single-aisle market, including advanced CFM International LEAP-1B engines, Advanced Technology winglets, and other airframe enhancements. For more information and feature content, visit www.boeing.com/commercial/737max. Based in Jeddah, flyadeal offers flights to eight domestic destinations including Riyadh, Jeddah, Dammam, Qassim, Tabuk, Gizan, Madinah and Abha.